The Mitee-Bite X-Plate System is an extremely versatile modular fixturing platform for 3, 4 and 5 Axis applications. "X" identifying 10 or more rock solid easily configurable everyday solutions. 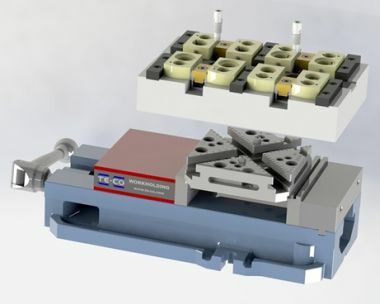 The X-Plate has many mounting options including a precision quick-change system when clamped in your vise, grid or t-slot plate, and of course as a multi-functional face plate for your Indexers and 5th axis machining centers. The X-plate System is designed to save time, material cost and provide more options when determining best method for the next job.